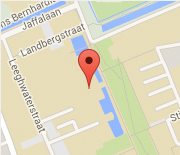 Sjors joined the Delft Haptics Lab in nov 2014. He performed a 3-month internship in 2015, at the lab of Franck Mars in Nantes. After working as a teacher for a year, he started his MSc thesis in the HMI Lab. Sjors implemented a goniometric method for calculating time-to-lane-crossing (TLC), and used this as basis for an alternative controller, that is triggered by safety margins (as opposed to the traditional trajectory following controllers). He performed an experiment to empirically compare the two types of algorithms for haptic shared control.